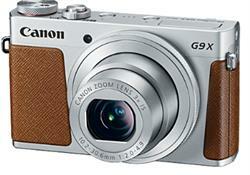 The G5 X digital camera from Canon features a 4.2x Optical Zoom f/1.8-2.8 lens a -24-100mm (35mm) Equivalent. The PowerShot G5X camera features DIGIC 6 image processor to form the Canon HS SYSTEM for enhanced low-light capabilities, fast performance and full HD 1080p/60 video recording. 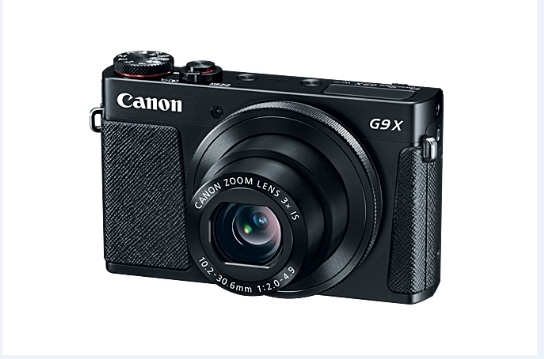 The PowerShot G9 X is a pocketable compact camera featuring a 20.2MP 1" High-Sensitivity CMOS sensor and DIGIC 6 image processor. NEW YORK, NY--(Marketwired - October 13, 2015) - B&H Photo would like to share the announcement of two new point-and-shoots from Canon: the PowerShot G5 X Digital Camera and PowerShot G9 X Digital Camera. 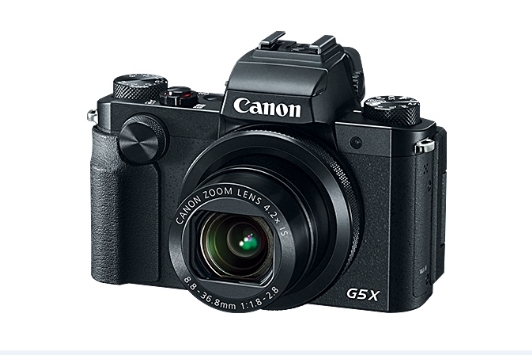 The G5 X takes a seat just above the current G7 X, thanks to the addition of an integrated 2.36M-dot electronic viewfinder, while it still uses the excellent 20.2-megapixel 1" High-Sensitivity CMOS sensor, DIGIC 6 processor, and 24-100mm equivalent f/1.8-2.8 zoom lens found in the predecessor. The camera retains a slim, lightweight body design along with the 3.0" LCD touchscreen and intuitive control ring and front dial for quick access to camera functions and settings. Also, the G5 X can capture full HD 1080p video at up to 60 fps. Other features include a hot shoe for support for Speedlites and other accessories, built-in Wi-Fi and NFC for connecting to smart devices or the Connection Station CS100, and a Star Mode for taking photos of the night sky. The Canon PowerShot G5X camera features Dedicated Star Modes and functions can be used to capture photos and videos of the nighttime sky with enhanced brilliance and clarity. Star Nightscape, Star Trails, and Star Time-Lapse Movies can be recorded, with auto or manual settings, and support functions, such as Night Display, Color Adjustment, and star Emphasis, offer greater control over the final results. A built-in pop-up flash can be used to provide additional illumination to a scene when working in challenging lighting conditions. 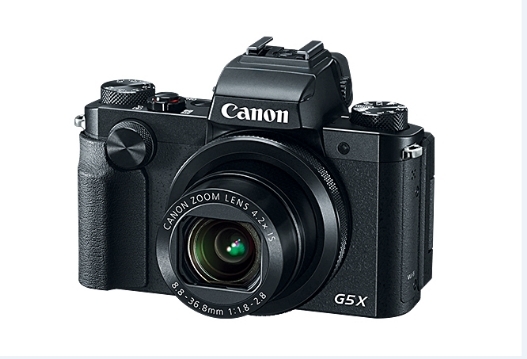 The Canon PowerShot G9X digital camera shares many of the features of its larger siblings, thanks to the implementation of the same sensor and processor, though it lacks an EVF and has a more modest 28-84mm equivalent f/2.0-4.9 lens with Intelligent IS. 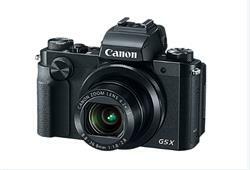 It is very compact and has the same HS System 20.2-megapixel 1" CMOS sensor and DIGIC 6 processor described earlier. The camera also has a 3.0" LCD touchscreen, control ring, full HD video at 60p, and continuous shooting up to 6 fps. This model will be available in black or silver.